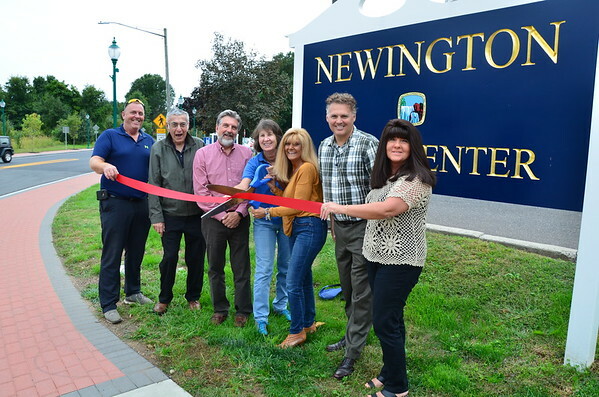 Newington Town Council members recently held a ribbon-cutting ceremony to mark the completion of the Constance Leigh Drive Streetscape project. This is the latest in a series of initiatives that have transformed the town center, including improvements along Main Street, Market Square, East Cedar Street and the Constitution Square parking lot. Turning in from East Cedar Street, Constance Leigh Drive now has the feel of a boulevard, with two-color paver sidewalks on each side, street trees and decorative lighting extending to Market Square. In addition, sidewalks have been added between Market Square and John Stewart Drive, filling in a gap that previously existed and providing safe pedestrian access to the bus stop on the east side of Constance Leigh Drive. Other safety improvements include adding a stop sign at the intersection of Lowrey Steet and Constance Leigh Drive, and new crosswalks and pavement markings that have a “traffic calming” effect. A prominent sign reading “NEWINGTON TOWN CENTER” with the town’s logo now stands at the corner of East Cedar Street and Constance Leigh Drive, further welcoming people at the new gateway to the central business district. Paid for with a state grant of $470,000, supplemented by $70,000 of town funds for engineering costs, the town will work with its legislative delegation to seek additional state streetscape funds to continue the boulevard look of Constance Leigh Drive between Market Square and Lowrey Street. Posted in Newington Town Crier, Newington News on Wednesday, 17 October 2018 14:42. Updated: Wednesday, 17 October 2018 14:45.